the velvet forest still fits correctly. i thought with all the stitching it may have pulled out of shape. since the blocks can be lined up corner to corner all should remain fairly in line. 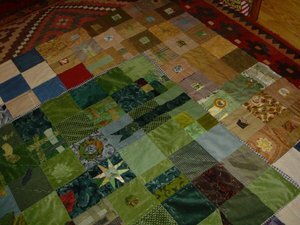 there is more to be added but i will continue the tapestry style quilting through the weekend and then put the thing together. less portable but i need a "whole cloth" to speak with now. the check fabric sticking out around the edge is the gauzy fabric i lined the velvet section with for stability. i may leave some of the fringe peeking out. may not. this layer also acts as a filler/ needle catch that i can quilt either side to with out going all the way when needed. i am entertaining some detachables in addition to the river section which will cover the lava on the front. some small button-ons or tie-ons. maybe a box of these for the new owner to play with in quiet moments. did a sketch on this idea a while back . time to revisit the idea.